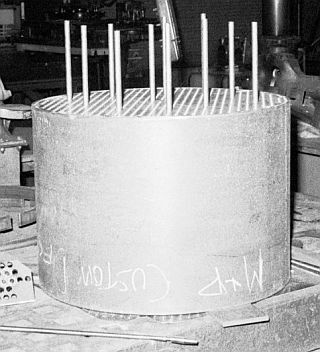 Once the bottom flue sheet welding was complete, the top flue sheet was set in the boiler shell and aligned with multiple steel rods in the flue sheet. This insured that the two flue sheets were aligned. The top flue sheet was then tack-welded into position, the rods removed, and multiple welding passes performed to completely weld the top flue sheet to the boiler shell.